Drizzle the unique flavor on crostinis or pair it with your cheese plate. Earthy and piquant, the intensity of chopped shallots and smashed cloves of garlic. Truffles don't just waft to your olfactory senses, they immerse them. 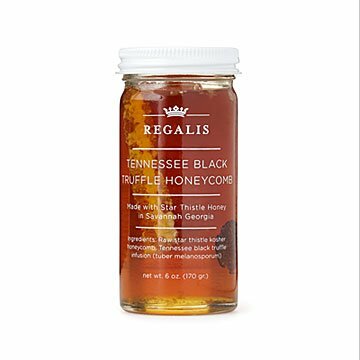 So, what better ingredient to pair with truffles than airy, sweet honey? Ian Purkayastha, a renowned truffle aficionado in New York City, will revolutionize your cooking with his raw star thistle honeycomb infused with Tennessee black truffles. Each truffle is plucked from the rich soil in Chuckey, Tennessee, and swirled in splendid harmony with honey harvested in Savannah, Georgia. Drizzle the unique flavor on white pizza, or pair it with your favorite cheese from gouda to chevre. It also makes an impressive gift for your foodie friends or those with adventurous taste buds. Handcrafted in Long Island City, New York. Keep in a cool, dry environment. Do not refrigerate. I bought this as a Christmas gift for my parents. They were excited to try it. They said it was very interesting and thought it almost had a hint of garlic. I only had one taste. My husband is eating like bear cub with Manchego cheese. This is the best honey I've ever eaten. So good. The smoky flavor of the truffles is subtle and delicious.